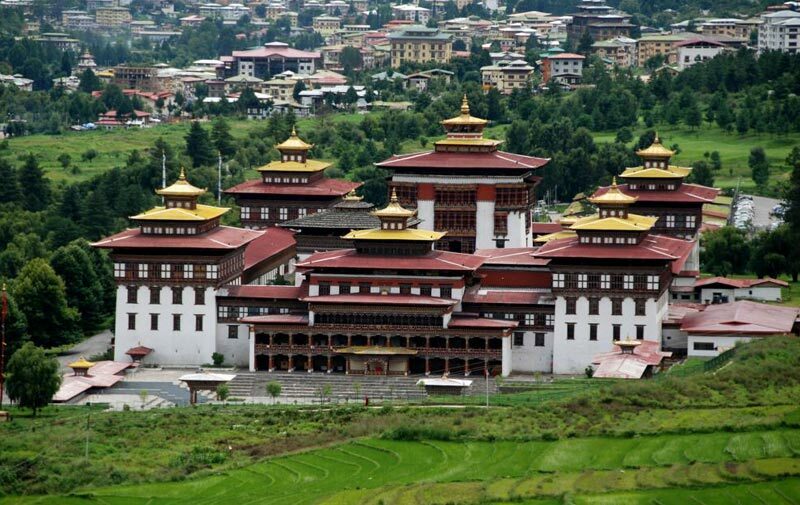 After landing at Airport we will drive to Thimphu, the capital city of Bhutan. En-route, visit to Ta-chhogang temple and hike down to 14th century suspension bridge made out of iron chains. The great engineer and Buddhist poet call Lama Thangtong Gyelpo or Lama Chamzampa (bridge maker) built it. After Lunch, visit to Memorial Chorten, constructed in the memorary of 3rd King, Jigme Dorji Wangchuk. Visit to Bhudha point and have glims of Thimphu City. Halt a night at Thimphu At Sambhav Hotel. After a Break, visit to Painting School, It is the centre of learning for Bhutanese artists, depending upon one interest, one can specialize in one of the thirteen arts and crafts. The thirteen arts include painting, weaving, sculptures, black smith, embroidery etc. 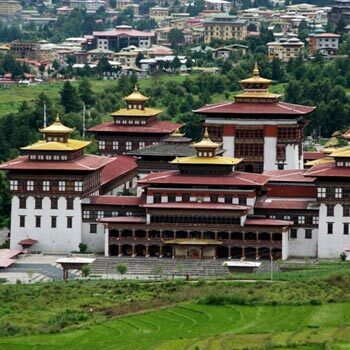 This is the best place to learn about Bhutanese arts and crafts. Explore Thimphu Town, after lunch we will explore Thimphu Town. Thimphu has one long street and two half street. The Town is small and people are quite friendly. If you are interested in buying authentic handicraft best place is to visit Craft Bazar. Later drove back to Paro in the evening. Night halt at Paro. In the evening drive to Paro. In the morning, we will drive to road Point after breakfast. 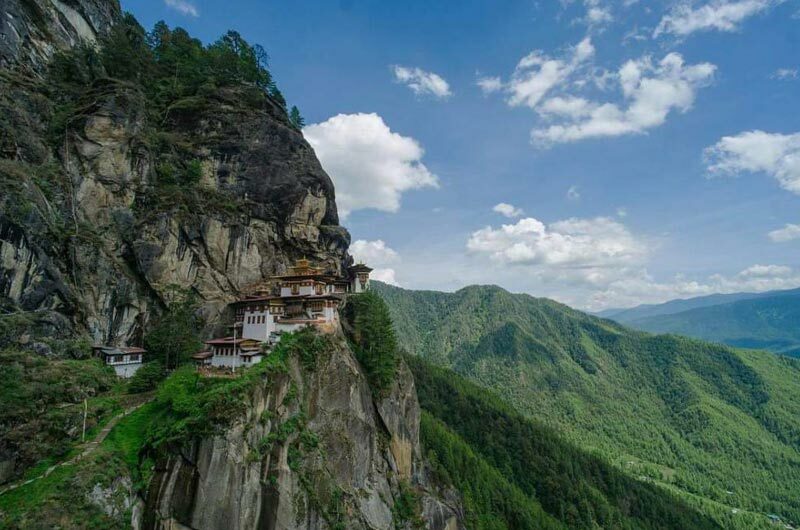 We will hike up to the Taktsang Monastery (Taktsang means Tiger’s Nest), which is 900m high above the floor of Paro valley. According to the legend, it is said that Guru Rinpoche flew to the site of the monastery on the back of a flying tigress in 8th century, and mediated for three months. Leisure walk of 4-5 hours on footpath that gradually winds it way up. 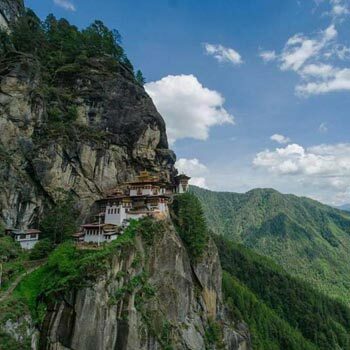 We stop at Taktsang cafeteria and have a glimpse of spectacular viewpoint of the jagged cliff looking as if it was clutching and protecting the very monastery built into crevice. Lunch at View point and overnight at Paro.